The line was built by the Charleston & Western Carolina Railroad in the 1890s. C&WC became part of the Atlantic Coast Line System in 1897, was merged into the ACL after 1959. The GP-7's & F7's were painted in the ACL's scheme of Purple/silver but were lettered for the C&WC instead of ACL. 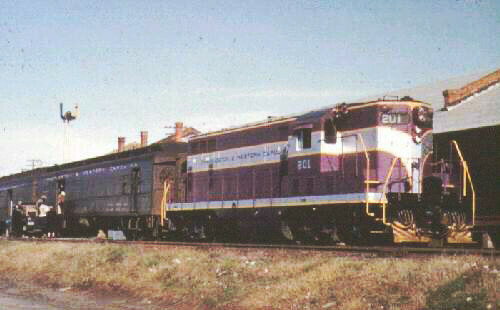 When the ACL began repainting their units in the black/yellow stripe scheme the CN&L units were also repainted and renumbered. For more details refer to the Book "ACL-the Diesel Years" by W. Calloway. Decals	 	MS #87-124-6 Yellow stripes 1" & 2"
Decals	 	MS #87-214-6 Yellow stripes 4" & 6"